A Side of Faith is HERE! And you can’t have a book launch without CELEBRATING, right? Of course not! So today is party day here on my blog, and I’m ecstatic that you’ve joined me! What IS a blog party, you ask? Well, here is MY version of it. A blog party is basically just an all-day open house where you can come and go as you please! YOU can leave comments, ask questions, click on links to buy the book… *grin* and register to win the FAITH-FILLED goodie basket I’m giving away! the mistakes of her youth. A Side of Faith is a NOVELLA. See this post if you’re not sure what that means! The setting is in Sandwich, Illinois, a REAL town about an hour or so west of Chicago. There is NOT the “first” Sandwich book, just the first novella! 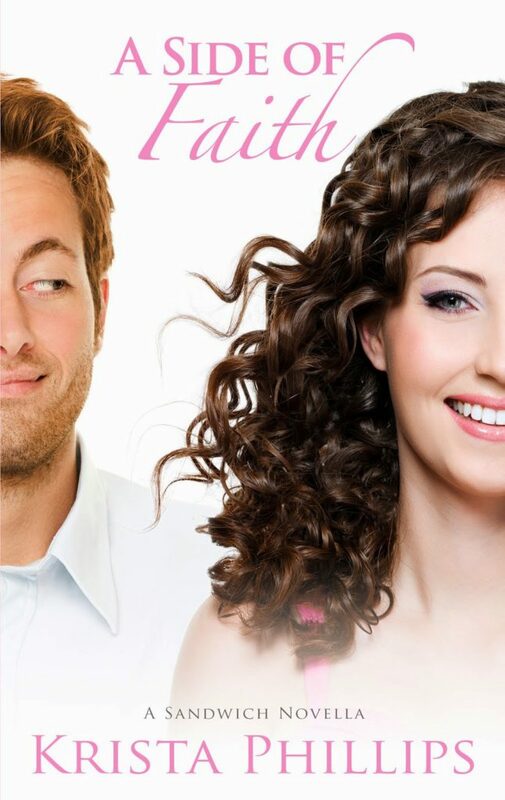 Sandwich, with a Side of Romance released in 2012 and is a full length Christian romance. While the characters are in A Side of Faith, they are no longer the main characters. For those of you who’ve read Sandwich, you’ll be excited to hear that Reuben and Maddie have some FUN news to share…. I worried that readers would be confused when they find the heroine’s name isn’t Faith…instead points to the THEME of the book! Because I published the book myself, it won’t be found in libraries or non-online bookstores. Boo! Two more novellas are planned! A Side of Hope will release this winter and A Side of Love will release in the Spring. I also plan a “finale” full length novel for next fall called, The Greatest is Love. My hubby and I have four amazing, beautiful daughters, ages ranging from 13 to 4. We’re currently shopping for shotguns to keep those prospective boys in line….. I met my husband in a chatroom at 17 years old. I married him a year later, and gave him our first daughter a year after that. I thank God everyday that the crazy guy I chatted with didn’t turn out to be an Internet predator…. He’s pretty awesome, actually! I have a super awesome new agent, Sarah Freese of WordServe Literary! We’re working on selling some other projects outside of Sandwich…. so stay tuned! A Side of Faith is available at most major online retailers via ebook! It is ONLY available on Amazon.com for the paperback version. I’m so excited about the gift package!! During my launch party for my first novel, Sandwich, with a Side of Romance, I gave away a SANDWICH themed basket. 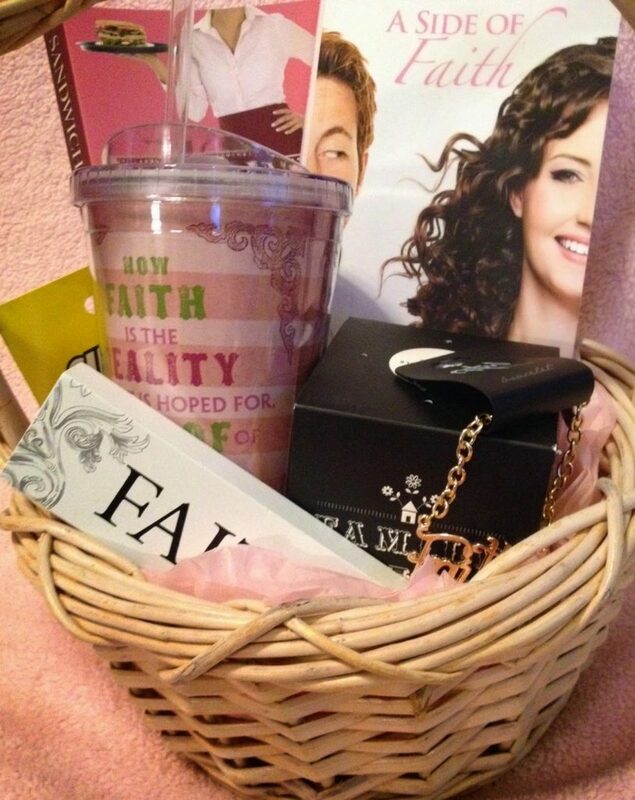 I decided this time, I would do a FAITH themed basket. And just because I couldn’t forget the sandwich tie-in all together… a $15 Subway giftcard! I’m using Rafflecopter to track entries! You’ll have a bunch of different ways to enter, up to SIX entries per person! If you have issues using rafflecopter, let me know in the comments below and I’ll walk you through it! *Note* Only entries made through Rafflecopter will be counted! Let’s chat about faith and books! I’d love to answer any questions you have, or hear YOUR faith story! Yay!!!! It's here indeed! I just received it on my Kindle and will start to read as soon as I have time! Congratulations!!!! LOL! I still have two weeks vacation left so yes, I'll be reading your novella today or tomorrow for sure! LOL, well, I hope you enjoy it, and enjoy your last two weeks!!!! Can't wait to read the new book! Congratulations! LOL. Side dishes are oh-so-important. A few healthy veggies and some yummy mashed potatoes/french fries… and dessert can be a side too, right!?! Best wishes for a successful book launch. Can't wait to read it. Congratulations on your new book! I am finishing up Sandwich so can't wait to read this next. So this is not a sequel but does include the Sandwich characters? Oops! I really didn't leave a faith related comment or question in my previous post. Sorry! I guess my question is: Do you use any of your characters to share your own faith experiences? Tammi, that's a great question! I think a little bit of everything I write comes out of personal experiences. Most times it's just a little nugget that I take, twist, and expound on. A Side of Faith is about having faith that God knows what he's doing, even if he gives us something we never wanted. For me, Annabelle was that something. Not that I didn't want her, obviously, but no mother ever says, "ohhhh, I want my daughter to be born with a heart defect!" But that's what God has given me. And oh goodness. Annabelle has caused me to grow and learn and stretched me more than I thought possible, and I can't imagine life without my sweet pumpkin. I would not be anywhere near the woman I am today without that sweet child. Thanks for the insight. Being the mom of a CHD boy, I can definitely say a big, "Amen, sister,"
Maria, your comment made me tear up!! I'm SO thankful for YOU too, my dear! And SO glad you haven't had to use that epipen! Allergies are one thing that, praise God, we haven't had to deal with! Scary stuff!! Congratulations! What a beautiful cover, and it sounds like a great story. I'm so excited for you. I'm pretty sure we at a meal at ACFW in Dallas. It was my first writing conference, and you were very nice to me. I'll always remember your kindness. Thank you so much for stopping by, Jackie, and for your kind words!! They made me smile this morning! You have a GREAT memory!!!!!! Will you be at ACFW this year again? I'll be there, and would love to see ya!! Yes, I'll be there. I'm driving from Kentucky and will arrive sometime Thursday. It'd be great to see you! Congratulation! I can't wait to read it. LOL! Love the pun!!!!!! Thanks!! Celebrating with you, Krista! And it was fun to hear about your real-life, chatroom romance. Ever plan to use that in a novel? YES! Actually, my first book was based on that experience. Problem is: Chatrooms are no-goes anymore so it's a bit outdated! I'm still brainstorming ways to bring it "up to date" so I can publish it! We shall see!! Woohoo! The first thing I did this morning was buy the book! I'm going to be reading it on the old treadmill today. I love that cup in the gift basket! Congratulations, Krista! THANKS, Jessica! And thanks for your tweet as well! You rock! Valerie, which stories were those???? Were those the LOL ones?? I think so. I'm remembering a guy named Jack (I think?) and a woman who was a compulsive garage-saler. Congrats Krista!!! So I'm struggling to have faith in a certain situation right now so here's my question for you. During your most faith challenged time in life what scripture did you cling to that helped you hang on until the storm passed? Oh there are so many!! Jer. 29:11 was a big one… reminding myself that God has a plan, and it is a GOOD one, even though it doesn't feel like it so much right now. I read a lot about Moses too, and the Israelites. I remember as a teen reading about their complaining and thinking, dude, a bunch a of whiners!!! And when I was going through the desert times with Annabelle, God brought that to mind. God has been faithful and brought us through so much, and shown his faithfulness time and time again. How could I not trust him when things got tough?? When all else fails, God is still God. Though storms and crud may whirl around, HE is still on his throne, and keeping my eyes on HIM and not of things of this world is the ONLY thing that kept my sanity. Sorry, that is more than one scripture, but it is a hard and important question to answer!!! Congratulations! I can't wait to read this one. I am excited for my paperbacks to arrive later this week! I simply loved this novella! I can't wait to read it again! Congratulations, Krista! Thanks so much!!! SO glad you liked it, Kat!!!! I can't wait to read it and to see what is in store for Maddie and Reuben!! Congratulations Krista!! As a mother, I worry to much about my children. The baby has left to go to college, the middle one moved out and our oldest has moved back home. The oldest is a fireman and in the army. Is worrying a lack of faith? In a perfect world, no, we wouldn't worry. We would trust that God has our kids in the palm of his hand and be completely at peace with that. But it isn't a perfect world. And we aren't perfect. We love our kids, and we worry for their safety, for their grades, for the friends who might influence them badly, for a billion of other things. For me, YES, I worry about my kids. It doesn't mean I don't have faith in God, though. And I do recognize that I need to give that worry over to God and not let it consume me, otherwise I will become ineffective as a mother. And while it is the "Christian" thing to say "concerned" vs "worried" and we joke about it, I really do think there is a difference. My job as a mom is to take care of my kids, and I believe God gives me concern and checks in my heart when I need to step in. I'm not going to sit by and watch my kid jump of a bridge because I have faith God will stop her. That's silly. I'm going to do what God calls me to do, be their mother and show them love by protecting. Congratulations Krista! I'm looking forward to a GREAT read. Thanks, Becky!!! I really hope you enjoy it! Blessings! Congratulations on your release, Krista! I wish you all the best on your new venture into indie publishing. Oh thank you Keli!!! You're such an encourager!! Seriously, you've made such an impression on me since the first time I met ya and I just love ya to death! THANK YOU friend!! YAY YAY YAY YAY YAY!!!! Soooo excited for you! *grin* THANKS friend and oh-so-fabulous crit partner!!! You're next!!! Bought, downloaded, hoping to enjoy this "side" dish this evening! *grin* I'm lovin' the whole side dish thing! It's oh so appropriate!!! Have you ever heard of the 2001 Supreme Court ruling giving "Good News Clubs" and all religious organizations equal access to after school activities in public schools with parental permission? And is there a Good News Club in your children's elementary school? Marcia, I was aware that they were able to meet! Hope this isn't a duplicate post – having some computer issues today. I'm sure it is computer related and not the user! I'm so excited for this novella! I have pulled out my "Sandwich" book and will reread it this week as I wait for, "A Side of Faith" to arrive! I'm one of those who still prefers the actual paper in my hands. Thinking about faith. I'm the mother of two, one with autism. Talking with and watching them, I am continuously reminded of their child-like faith. So often, I wish I could figure out how to regain this type of faith! Kristi, amen, me and you both!!!! Sometimes it's the simple things, like when they launch themselves toward my arms, trusting that I'm going to catch them. THAT'S what I want to be like with Jesus, where I can just fall into him, not doubting for a moment that he will catch me! I know, right? My favorite is if I lose my keys, phone or something. I enlist the help of my kids and my 8 year old son says, "Mom, just pray." Krista, I am so excited to read this novella! I loved "Sandwich" and even bought a second copy and gifted it to a friend! My question is- Did you ever play around with other cities besides Sandwich, or did you always know that's where you would set your novella? Oh I definitely knew it would be Sandwich! My idea was to write a sequel, but then the idea of smaller "sides" in novella form sounded intriguing. It's an exciting day for you. Congratulations. Thanks, Velma!!!! I appreciate it!! Your book has such an amazing cover!! And the story is well done. My favorite part is the humor. Congrats, Krista. Congratulations! I know this is a major accomplishment! Not sure how you managed to find time to write but I'm sure I will enjoy this a lot! Lisa…. my house stays not very clean….and we eat a lot of PB&J! LOL! congratulations on getting your next book out there. I have followed your blog for a few years now and love reading of the progress of your sweet Annabelle and her sisters, and of course your writing. Congratulations to you and may God bless you with sales of your book!!! Thanks, Tammie!!! I love sharing about my princesses with you too! They are my pride and joy!! Yeah!!! So glad you're enjoying it, Casey!!! Congratulations on publishing another book! I'll be ordering it as soon as I get a chance. And, by the way, chocolate is REALLY good for you – it's all the sugar and fillers that aren't. I know of a local guy who makes some agave sweetened, natural, organic chocolate that's delicious! Keep sharing your faith! I thought I commented, but don't see it…..well done on a new book and how do you do it!?? Congratulations, Krista, on your new release! Glad I found you through the CIA. Your website is lovely and what stories you have to share. Wishing you blessings today and on the future projects you mentioned. I LOVE novellas. What a fun "faith-filled" giveaway! THANKS Sherida!!!!!!! It's so great to have "met" you too!!!! I loved Sandwich and I'm looking forward to A side of Faith! I can't wait til payday so I can order it. Oh so glad you stopped by, Rebecca!!!! I hope you enjoy it!!! I can't wait to read the new book 😀 Your first one was really good!! Oh thank you, Diane!!! That is so sweet of you to say! I knew we had things in common, Krista – Dr. Pepper is my "vice," as well. Love the stuff! Congrats on the new release! It sounds great. 4th times a charm, right? My comments are not coming through, so here goes it! This blog party ROCKS, Krista! Sooo cool! Buying my copy if A Side of Faith right now! Yay! And how did I not know you were from Sandwich?? I thought it was just your grandma?! Don't know where I got that from 🙂 sleep deprivation us dangerous to the mind. So tell me… How do these mc's know maddie and reub? Oh,, yes, that is a great question! I know it's been a bit since most have read Sandwich, but Rachel was actually mentioned in Sandwich and made a guest appearance at some point. She was a mother figure to Maddie at one point, although she was only about 8-9 years older than her! Faith in in Jesus Christ is the only one who keeps me grounded in everyday life and helps to humble me on a regular bases. Dear Krista, I lean more towards chocolate and cherry soda. What was the turning point for you in your faith and what drew you to become an author? What was the defining moment? Turning point in my faith… I think we can all look back and see certain things that drew us closer to God. I "gave" my life to Jesus when I was 11, so that was a pretty big moment for me. I'd always "known" Jesus, but I made the decision to be forever His on that day. I think my biggest turning points after that, though, came when God refined me. The news of my unborn daughter's heart defect and the year long struggle after that was probably the that changed me and refined me the most. I met my husband online too but, through eharmony. I can't wait to read your new novella! Thank you so much, Karen!!!! You are such an encourager and so sweet!! Congratulations! So happy for you! I loved your first book and can't wait to read A Side of Faith. Did you have this story line in mind as you were writing Sandwich, with a Side of Romance or did you come up with it later? Did it take unexpected twists and turns along the way? As someone who is not a writer I find it interesting how authors develop story lines and characters. I did not have this story in mind when I wrote Sandwich. When Rachel popped in the scene in Sandwich, my heart did tug a bit, wanting to tell HER story and give her a happy ending, too. Writers are very different as far as how we plot. Many authors outline and have very detail plot lines before they start. I am not one of those!!!! My process is a bit scattered. Sometimes, like this book, I start with a character and let it grow. I have one book that I've started that I got a picture of a fun "hook" for the first line, and started writing the book from that. So yes, lots of unexpected twists and turns came along the way, which is the fun in writing it for me! I'm hoping the readers are as surprised by a few of them as I was! My scale says there is!!! I call it a liar though and instead continue to blame the too-high numbers on my 4 kiddos! The youngest is 4 now though… so that excuse is running thin! Krista, I loved the first book. Pun intended, I inhaled it. I can't wait to read this novella. Best wishes to you! LOL, I'm a big fan of sandwich puns!!!!! Thanks, Julie! Love the first and can't wait to read this one! May I schedule your new book on my blog. Lena, absolutely!! I'll shoot you an email!!! I'm arriving late at the party and am not going to take the time to read all the questions and comments right now, so please forgive me if you've already had this question. I read Sandwich, With a Side of Romance (and really liked it) and am happy to know A Side of Faith has some of the same characters. I'm wondering if they will also appear in your subsequent novellas and novels? Your characters were very easy to like and the ending of Sandwich left some room open for more stories about them. Congratulations on the publication of A Side of Faith! Oh, yes, definitely!!! And that is a GREAT question! Maddie and Reuben will most likely have some sort of guest appearance in each book…. Tilly from Sandwich (most wont' remember her, but she was the waitress at the Emporium) is the heroine of A Side of Hope. A Side of Love is still in planning stages. And… The Greatest is Love will bring back Livy, which I know everyone didn't love. What most didn't know is that she had her own back story (which had to be edited out…) and while she was still a nasty, mean woman, she had her reasons, too. I'm a big believer that we all need redemption and grace, and The Greatest is Love will bring Livy full circle. Hmm, I commented earlier but it doesn't show up. Anyway, congratulations! How much of your books do you plan out before you start writing? I remember you saying a plot twist took you by surprise, so how much do you plan in advance and how much do you come up with as you go? Honestly, it depends by book. I'm mostly a seat of the pants writer, so I do very little planning. I usually get 1/3rd into the book and take a breather, see where I'm at and where I'm going, go back and refigure some stuff if I don't like it, and jot down a few plans for the end. I do that again at about 2/3rds into the book. Usually I'm writing the first half of the book with an idea that SOMETHING is missing, and praying God hits me with that something right about halfway through, LOL. Okay…question for you. What made you pick red hair for your hero? You don't see that very often! You sure made him soooo appealing! Oh Sherrinda! there is a REALLY REALLY good story behind it, and I think it honestly needs a blog post of it's own! Let's just say, a red-headed boy once totally ruined a friendship back when I was in the 7th grade, so giving Cameron red hair was a bit of an apology, book style! Mmmm, I'm intrigued. Definitely do a blog post! Wow! a Panster, huh. I wrote my first book that way, but it took 5 years, so I plot sort of, but if my characters take off in a different direction, I go with that. Love your first book and will get this one! Patricia, yes, characters like to have a mind of their own sometimes, don't they!! I worked on a book for YEARS that I'd outlined to a T, but never got past chapter three. Wen God told me it was time to write again, I didn't outline a thing. I just sat down and wrote. 3 months later, I typed THE END. It sealed the deal of my panster status! I am so excited! I am a little scared, too. Will I feel cheated by a novella? We shall see later this week. Congratulations, I can't wait to read it. Oh I hope you won't feel cheated!!!!! It is a bit more fast paced that most books, but I still tried to put some surprises and twists in there! I've been following your blog for a number of years. It's amazing to see how God has been working to heal Annabelle and allow her to grow. My dad is a congenital heart defect patient and has gone through many open heart surgeries, 4 in my life and 1 in the past year. It is always such a journey, even as he had an echo this morning. My family is not Christian so my faith story has been written by God with the influence of friends. I commend you for writing last week about your oldest daughter having conversations of faith and loving her friends. Those are the kinds of high school girls I met and slowly they invited me to more and more church activities and I began to seek what Christianity was and God saved me towards the end of my high school years. Shortly after I became a Christian my faith was small, like a mustard seed and I began to learn the value of a church family when my dad underwent a test procedure to repair a leaking valve and it failed. He then had a second surgery 3 months later and the doctors discovered a second valve that needed not only to be repaired but replaced. Thank you for being honest and open with your struggles in faith through your own life, it is helpful to see others struggling too. Kendra, your post brought me to tears!!! I'm SO SO thankful God allowed those friends to speak into your life!! What an amazing testimony!! I love that God can take our little mustard seed and make beautiful things with it!! Thank you for sharing your story!!!! Will you sign my book. This is Jami BTW… not Julie. I see I'm late to the party! It is STILL Monday here on the West Coast. Looking forward to reading it and congrats! !